When the British Film Institute ran a Richard Attenborough retrospective back in the early 2000s, Sir Richard came to introduce every screening. The gesture seemed to capture his enthusiasm, modesty, kindness and warmth for cinema and audiences. At the screening of Seance on a Wet Afternoon he and the film’s director, fellow producer/actor Bryan Forbes, walked in together right alongside me with their wives and sat in a row. It’s a memory I particularly cherish when I watch his convincing performances as twisted characters, in Brighton Rock, London Belongs To Me (a personal favourite) and as the serial killer John Christie in 10 Rillington Place. There was also a sadness in looking back to that screening, because of the loss of his daughter and granddaughter in the Boxing Day Tsunami a few years later. 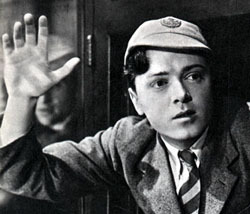 For all the great films he directed, (Young Winston still resonates for its perspective on British military campaigns in Afghanistan) I will always have the softest of spots for Richard Attenborough, the actor, aged twenty four, playing the bright sixteen year old inner city youth sent on an experiment in social mobility to private school as The Guinea Pig. This entry was posted in Film, Uncategorized and tagged bfi, british cinema, Bryan Forbes, cinema, FTW, Richard Attenborough, seance on a wet afternoon. Bookmark the permalink.